Why is mcrypt required when i'm just including a file? You should noticed that this question is old and the short tags issue was mentioned 16 times, also in the top comment of my question. I just share my solution, I was also facing the same error and after executing this command of mcrypt my issue solved. you may also try. Don't know why, but installer of PHP 5.3.15 doesn't add the line AddType application/x-httpd-php .php. Thanks a lot!! I need to enter the AddType mentioned but the file is read only. How can I overcome this and write a new line into it? @shmeeps: Where have you seen that short tags are deprecated? I've done some searching and can only find recommendations against them, nothing about deprecation. Granted for applications which are to be distributed it is better to use <?php in case the hosting server doesn't have them enabled, but for apps where you have full control over the server they're going to be on I don't see any reason not to use them. @ClarkeyBoy you're correct. Short tags were not deprecated, I fixed the answer. I checked httpd.conf and the line LoadModule php5_module "c:/php/php5apache2_2.dll" is missing. Isn't that weird or not? Anyway, should I added myself ? I also saw in other sites that you should uncomment line LoadModule php5_module modules/libphp5.so, is this something different? Windows user here. Point #5 did the trick. Already had a complete website using short tags. how to check point #1 on a shared server? @full_prog_full Try uploading a file with a .php extension with the contents <?php echo("Success"); ?> and see if accessing the file through a web browser results in "Success" being displayed without the associated PHP code. point #3 worked for me. Any idea why this is needed? There is no file called httpd.conf on my whole system. I searched with find / -name "httpd.conf"
@ulkas in ubuntu 16.04, for apache2 and php7, I installed sudo apt-get install libapache2-mod-php7.0 and it automatically configured my mods-enabled folder for php use. Given the command line and web server installs of PHP are often independent, I don't think point 1 is very useful. Also, given the reactions of people who ask this FAQ, point 6 should probably be upgraded to point 1. Point #3 did the trick for me! Thank you very much!!! I would clarify point #5, and mention that users should ensure their code starts with <?php. While this code snippet may solve the question, including an explanation of how and why this solves the problem would really help to improve the quality of your post. Remember that you are answering the question for readers in the future, not just the person asking now! Please edit your answer to add explanation, and give an indication of what limitations and assumptions apply. This answer is linux related the topicstarter is clearly using windows. @RaymondNijland true but this is canonical and I found this question and it saved me after over an hour of troubleshooting. How and Why: This happens when PHP7 doesn't configure the default fast-CGI service in the make script. sudo a2enmod proxy_fcgi setenvif creates three new mods /mods-available/proxy.conf proxy_fcgi.load proxy.load Likewise, sudo a2enconf php7.0-fpm creates a config file /conf-available/php7.0-fpm.conf Once this is done and Apache2 can then run the PHP7 module as a fast-CGI service. It honestly did, maybe because I hadn't configured the PHP properly on my system.But, since the question I asked regarding the same issue has been marked as a duplicate to this question, I only could answer it here. I wonder why the down vote. Just to help other people with this issue. The httpd.conf file is located in /etc/apache2/httpd.conf If you're using Ubuntu, it would be apache2.conf in the same directory that needs to be modified for PHP7. you just reinstalled entire server.. This also solved it for me. Does anyone know if the sever will execute php in a .html file or does the file ending always have to be changed to .php when there's a line of php to be executed? PHP works fine (checked using command line). 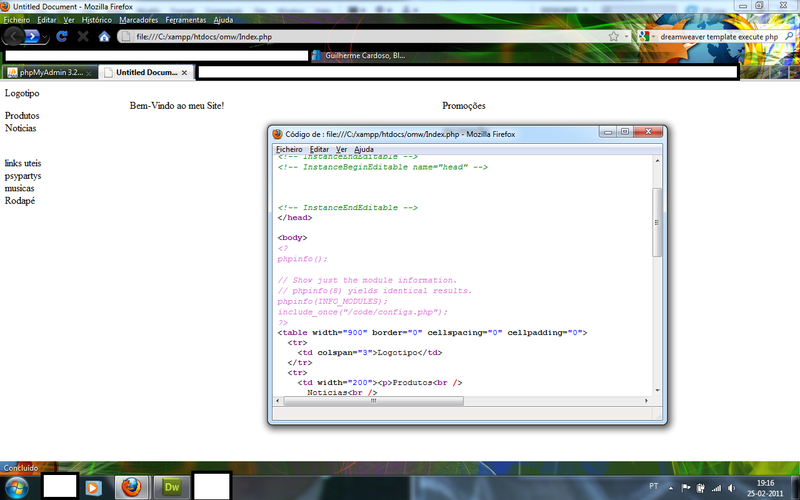 but, when I access the file using URL, it shows PHP code. Where are these config settings exactly? @cronoklee In vHost settings of httpd.conf. For existing hosts, you need to edit apache config in webmin. For future hosts, go to virtualmin > server template > apache website. Eitherway, this is not as secure as fastcgi - virtualmin's default. So the correct approach should be to troubleshoot why fcgi doesn't work, for example it may be caused by file permissions.